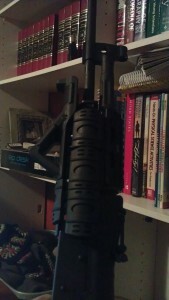 While popping in for a visit to Get Some Guns to test out our Broadsword Rifle, I picked up a MagPul AFG for my Kalash. At Crusader HQ, I also applied a permanent Slipstream treatment to my AK’s bolt/carrier group. Slicked that up big time. AK’s are never to be considered a Slick Rifle… and this one is still not so much. However, compared to other AK’s… DAYUM. This is one SLICK freaking AK! I love it. Okay, back to the AFG… I didn’t realize that Magpul now makes two versions of the AFG, the normal one and a smaller thinner one. For my AK, I went with the Regular Full Sized Magnum AFG. It fit really well. It looks awesome and feels awesome. I love it. Video review of it will be made soon. I can’t stop playing with this AK now. I took it to work hoping I’d get a chance to run out to the range on my lunch break to pop some rounds, but that didn’t happen. Instead I pulled off the highway on the way home from work after close – after dark – and drove about 200 yards (honest officer, I thought I was 200 yards) down a dirt road. Blasted through about 40 rounds of 7.62x39mm. I wanted to shoot more, but it was pitch black and I had no targets… but man. That was fun. AK muzzle flash in the dark is fun stuff. 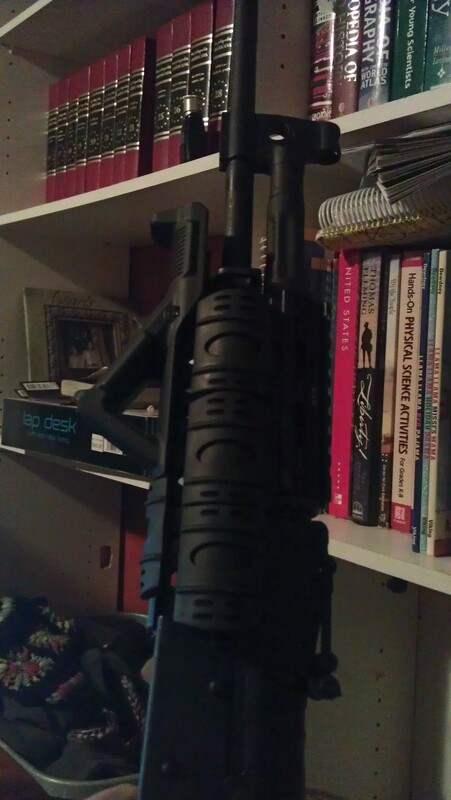 The gun is nice and controllable and I find that the AFG helps me get into proper position naturally. I just naturally Vulture Down on the gun. Did I mention that it looks sweet? Oh yeah. It looks awesome. The AFG solves a problem with using a Vertical Grip. I have plenty of room to rock out a mag and rock in a new one. A VFG can block the mag from rocking. And I want to rock as much as possible… so there you go. I’ve never heard someone use the term “vulture down”, but I know exactly what you’re talking about. So, I know it’s not legal to put a VFG on a pistol as that would turn it into an AOW … does anybody have an authoritative answer on whether or not it’s legal to put an AFG on a pistol? I’m guessing “no, not legal”, but that’s just a guess. The AFG on a Pistol? I think that would still be illegal. Great, now I’m going to have to get an AFG! So… I know your still setting up the Crusader AK package… But what are you shooting for, set up and price wise? Will these be a regular offering or a LEO (Limited Edition Offering for those that don’t know)? Oh yes. We’ll do AK’s. There will probably be a LEO version until we get kitted out to do our own regular build. Joe’s ideas to do our regular build… dang… it’s freaking awesome. Any AK aficionado will be lusting after these AK’s. But until then, we are still playing around with what an AK really needs to make it more effective and usable.